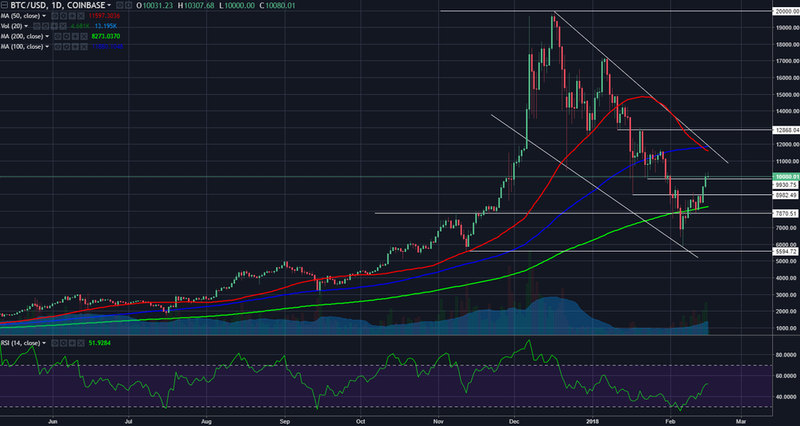 Bitcoin (BTC/USD) has been recovering sharply after dipping to $6000 in early February. It has cracked $10,000 in most exchanges and looks like a V-reversal. But I would expect resistance as price approaches $11,000. The daily chart shows that if price reaches $11,500, it will be facing some key resistance factors. These include the 200- day and 100-day simple moving averages (SMAs), as well as a falling resistance. Also note that the $11,000-$12,000 range was a sticky price range, meaning price stalled here for a while during the previous downswing. Finally, the RSI will likely be around 60. If the RSI turns down from 60, the market is likely not done with the consolidation/correction. Now, if resistance materializes and price does indeed retreat, we will want to monitor the $8900-$9000 area. If price can hold above this area, the probability of a stronger recovery improves.